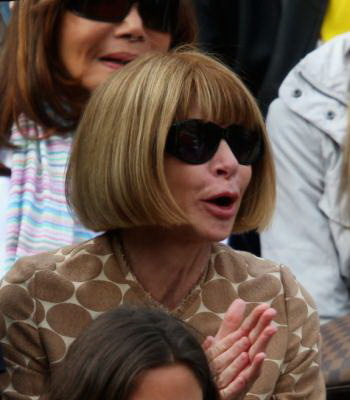 Anna Wintour, reduced to squealing fangirl | Ayyyy! Tying Pete Sampras’ record 14 Grand Slam wins is not a bad achievement on its own, but shouldn’t Roger Federer also go down in history as the only man that has been able to bring Anna to such throes of ecstatic delight? She’s in England ?Quick book me a flight out. @angela: Actually, this was the Paris Open so don’t be afraid. And I know it’s the face or the figure after a certain age, but that neck looks like it belongs on an iguana. Phew thanks ..trouble is the dreaded Wimbledon is due soon !! !